Employed at a carpentry shop in his earlier days, Mark would receive a small wage only once a month. He and his wife, a farmer, struggled to make ends meet for their growing family. 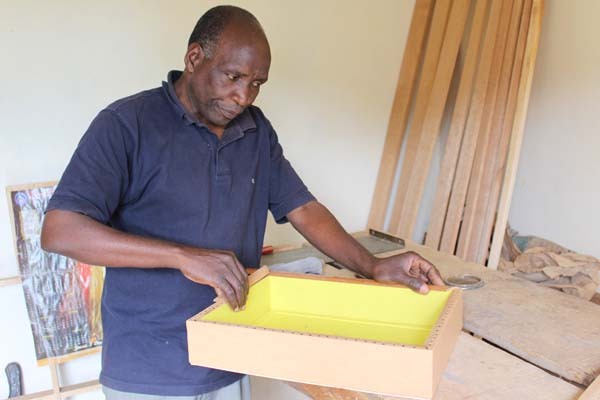 He opened up his own furniture shop to increase his earnings, but finding work continued to be a challenge. With five children, Mark expended himself managing his business, making furniture by hand and assisting his wife on the farm to help increase their income. When he was approached by Veronika’s schoolteacher expressing her concern that Veronika’s tuition wasn’t being paid on time, he knew something had to change. That was when he learned about Unbound. “I visited the Unbound offices in Masaka and I got a warm reception. I told them all about my troubles. Little did I know that this step would be a new beginning for my family,” he said. Soon, Veronika was paired with an Unbound sponsor, which meant her school fees would be paid as long as she remained in the program. Mark explained that in addition to Veronika’s tuition being covered, Unbound provided nutritional support when food was hard to come by, assistance in purchasing household items such as a water storage tank, and training on modern farming methods for him and his wife. Those friendships have come primarily through other parents in the area who also have children sponsored through Unbound. Parents are invited to participate in community groups that provide training, support and social interaction . Often referred to as mothers groups in the Unbound community, Mark’s group isn’t exclusively women — he just happens to be the only dad. With the stability that an Unbound sponsorship has provided for his entire family, Mark has also had the freedom to expand his creativity in the woodshop. Now, Mark’s carpentry mainly consists of unique photo frames that light up. His mastery of carpentry combined with his artistic talent led to a new height of achievement in Mark’s handiwork. “One photo frame that I had made was presented to our president, His Excellency, Yoweri Museveni,” Mark said. “Our local leaders know my work and they thought it would be a perfect gift for the president when he was visiting our district. Mark shows off a favorite example of his light-up photo frames — an image of Pope Francis. Another notable figure featured in Mark’s artwork is Pope Francis. 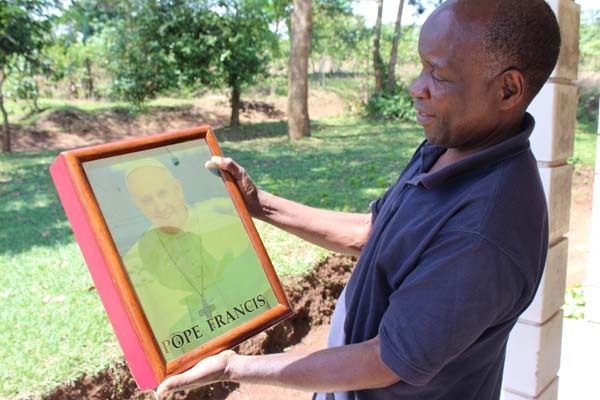 As a Catholic, Mark wanted to honor the Pope on his visit to Uganda by featuring him in his frames. Mark hopes that his children and grandchildren will take an interest in carpentry and keep his business going in the future. But for now, he’s focused on doing everything he can to be a loving and supportive father. He’s grateful that Unbound has provided the opportunity for him to have the space in his life to do just that. Help provide stability to parents like Mark. Sponsor today.